"Al, do you think I should ask Santa to bring me a blue one or a turquoise one? I like polka dots too, Al. What do you think about polka dots with my skin tone? Of course a nice leopard-spotted Fingerling would be very nice too. That would show I am concerned about the environment. Al, are your eyes closed because you're trying to picture how gorgeous I'll look?" " Al, I think you may have the right idea. I need to VISUALIZE how I will look....Oh, Al, I can see it, I can see it!! I am going to be stunning! Having my eyes closed works! I can "SEE" that Fingerling!! I wish Santa were coming tomorrow. I can't wait for Santa to come. I bet I will swim faster with my new Fingerling, Al. Would I swim faster with a MONKEY Fingerling or a UNICORN Fingerling? Al, I'm trying to visualize....mmmmm....."
"Santa, I know you have been very good to me over the years and I really REALLY want Darcy Jane to have a Fingerling, but I really REALLY don't want to swim over to measure her...." I explained. "Ho, Ho, Ho! That would be irresponsible!" exclaimed Santa. "Santa would not want any of his Apple Dumplings to do THAT! I want you to take a Mini Me to the park, I will just need one glance at Darcy Jane and Santa will know exactly what size Darcy Jane will need. What do you say? Will you help?" asked Santa. 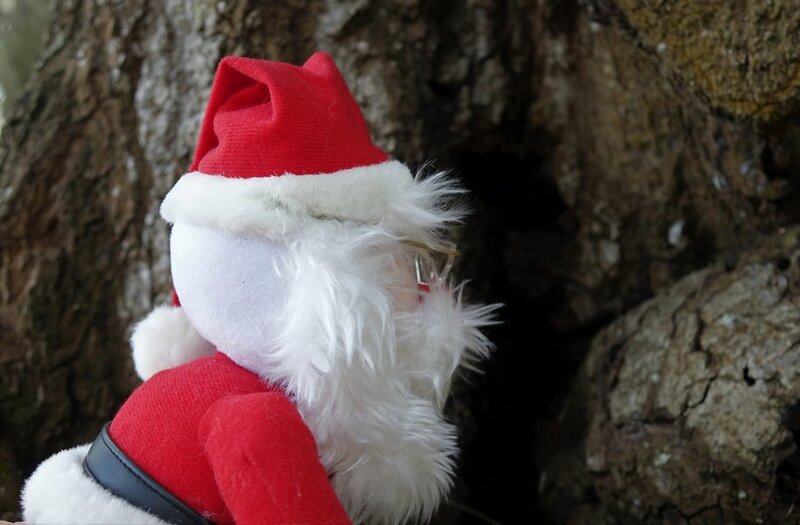 "Why are you looking in that tree? She won't be in that tree? We need to hurry this along. Watch the river...." I explained. Up ahead we could see that Darcy Jane, Al and a few of their friends were enjoying a few hours out in the sun. 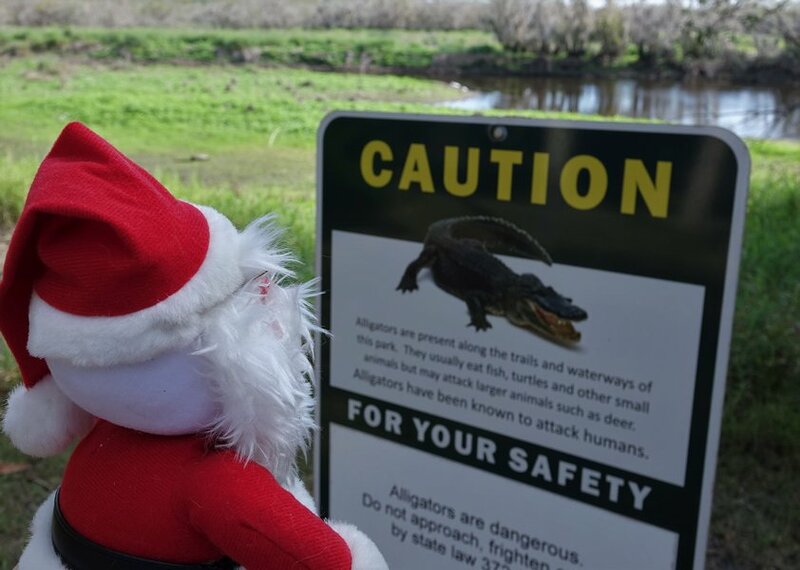 I mentioned to Mini Me Santa that we should be very quiet so that we wouldn't frighten Darcy Jane back into the river. Mini Me Santa looked at me as though I didn't know what I was talking about, but I remembered our children not being so keen with close contact with a big bearded guy wearing a red suit... "WHO DOESN'T LIKE SANTA?" he loudly proclaimed for all to hear. As I lowered my head in despair at our failed attempt to assess Darcy Jane's ring size, I slowly took a calming breath. Finally I asked Mini Me Santa if he wanted to try again tomorrow. I looked to my left...no Mini Me Santa. I looked to my right...no Mini Me Santa. Instead, a beautiful white egret appeared and reminded me, "He only needed a glance...."